Honda, the largest manufacturer of motorcycles and mopeds in the world (1,390,000 units in 1964) is proud to present the latest news from its renowned 50cc range ... the Honda 50 C-320. This extraordinarily beautiful machine has been specially designed to meet the needs of moped riders in the Benelux. The qualities and numerous advantages will ensure you a lasting row of pleasure. Completely new is the T-shape frame, which inspires the common admiration and whose robustness can withstand anything. This frame has undergone a special treatment to prevent rusting under the paint layer by means of a perfect anti-abrasion system: zinc phosphatation (currently the best treatment). The C-320 is of course equipped with the famous 4-stroke 49 cc engine which forms the basis of the enormous Honda success all over the world. Since this engine., which has a high level of perfection t reaches a 4-stroke, you will always stay clean and finally get rid of the annoying chore of mixing oil with gasoline, pollution of the ignition ... and staining of garments. The C-320 is economical and with 1.5 litres of ordinary petrol it has more than enough to cover 100 km (several kilometres for a few quarters). The maintenance on the other hand ... has been reduced to a minimum. Compare the expenses of any other means of transport ... and be convinced that Honda offers you one of the most economical vehicles in the world. Thanks to its special wide double seat in thick foam, its telescopic fork and its swing arm with hydraulic shock absorbers, the C-320 allows both driver and passenger to drive in complete comfort. With the C-320 you will drive safely and easily, thanks to the semi-automatic clutch and the ideal driving position of driver and passenger. The front and rear suspension is perfect. The highly effective brakes are dust- and waterproof. Precise steering and judicious weight distribution make this machine stick to the road, as it were. Besides the many other predominant Honda qualities, Honda offers you a perfect service, ensured by 2,000 points of sale in the Benelux. 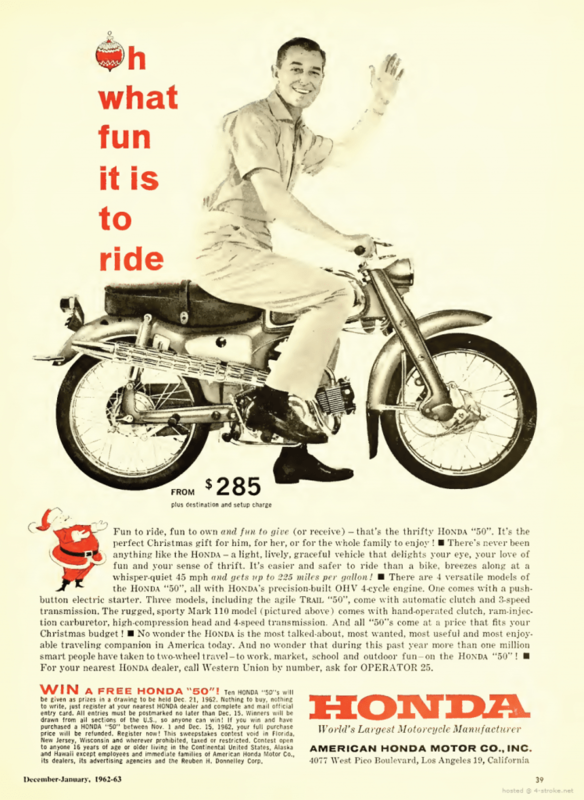 Ask your Honda dealer for a test drive today and you will be convinced that the Honda 50's are unsurpassable!